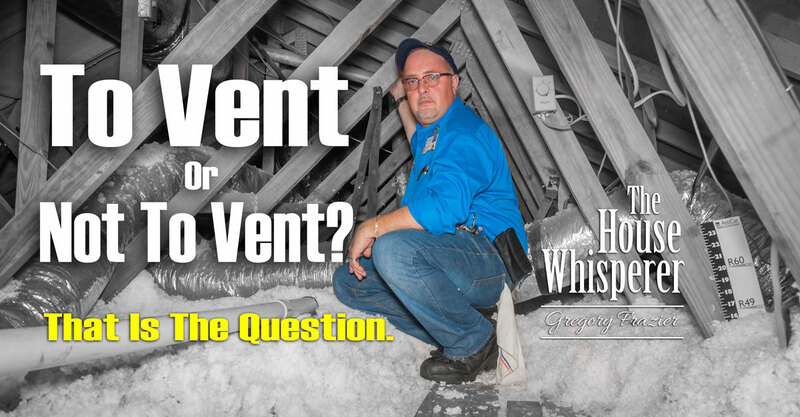 Home » Plumbing, AC & Electric Tips » The House Whisperer » To Vent or Not To Vent? That is the question. Welcome one and all! We previously discussed the fact that vented attics are stupid. I stand by that assertion. So, to answer the question posed in the title, the answer is no, attics should not be vented. As a recap from our last blog post we are taking our attic space from an unconditioned area to a conditioned space thus reducing the load on the ducts and the home overall. There are a couple keys to making a sealed attic work correctly. We must seal the soffit vents, we must properly insulate the attic, and we either need to have an escape path for humidity or install a dehumidifier. I strongly recommend going the route of adding dehumidification as it makes the application bullet proof. What I want to look at now are the three methods that can be utilized to properly insulate a conditioned attic. This type of insulation has been used for years and is a very effective method for helping to keep a home cool. You can have the fiberglass style insulation such as Owens Corning Pink system or you can have a recycled newspaper type. The installation of either is done rather easily using a machine to blow the insulation into the attic. The newspaper style of insulation has fallen out of favor over the years as with time it tends to break down and become less effective. In a sealed attic application using traditional attic insulation makes the most sense when you have a tight attic. If space is limited in the attic other types of insulation can become very difficult to install. There are several brand names of open cell expanding thermal foam on the market. The system consists of two pressurized tanks, an A tank and a B tank. Inside these tanks the foam is in a liquid state, hoses are connected to the tanks and a spray gun is on the end of the hoses. The gun mixes the two liquids from the tanks and a chemical reaction takes place creating expanding foam. This reaction happens very quickly so one must be able to move freely about the space in which the foam is being applied. The foam sets or hardens in a matter of seconds so working quickly is paramount. What the open cell part of the name means is that once the foam has hardened it still allows moisture or water vapor to pass through it. The foam is applied to the interior of the roof deck and any other insulation in the attic is removed. The open cell has the advantage of letting you know when you have a roof leak as it is water permeable. The disadvantage to open cell is that it does allow water vapor to pass through it. If the attic is not 100% sealed the dehumidifier will be an absolute must have. I can tell you from experience that achieving a 100% seal on any attic is difficult as an opening the size of a quarter can cause you grief in a sealed attic. If you’re doing it, take no shortcuts, do it right and just add the dehumidifier. Closed Cell Spray Foam comes in the same form as Open Cell, the delivery method and application processes are identical. The name Closed Cell simply means that when the foam has hardened it is not water permeable in any way; no water in any form can pass through it. The advantage to closed cell is that it actually strengthens the roof making the structure less susceptible to roof loss during hurricanes. The disadvantage is those pesky roof leaks become much harder to detect and a minor leak that would have been found with open cell foam can become a major leak without you knowing it. In terms of cost most people gravitate to the open cell foam as it is about 25% less in cost. This is a very broad overview of what is needed to insulate an attic correctly and if you are considering this type of project make sure the contractor you are going to hire knows his stuff. Done incorrectly a sealed attic can become a home owner’s worst nightmare. Alright my friends the time has come for me to take my leave and go play with a couple air conditioners that aren’t working. There’s a surprise, right? Until next time I was chatting with a French friend of mine and I asked her if she liked to play video games? Her response was Wii.